Podcast: Should you speed date at your next conference? In this episode of The College Marketing Podcast, I chat with Jake Mayfield of College Inbound about our recent experience at the PRIMA NC conference in Wilmington, NC. 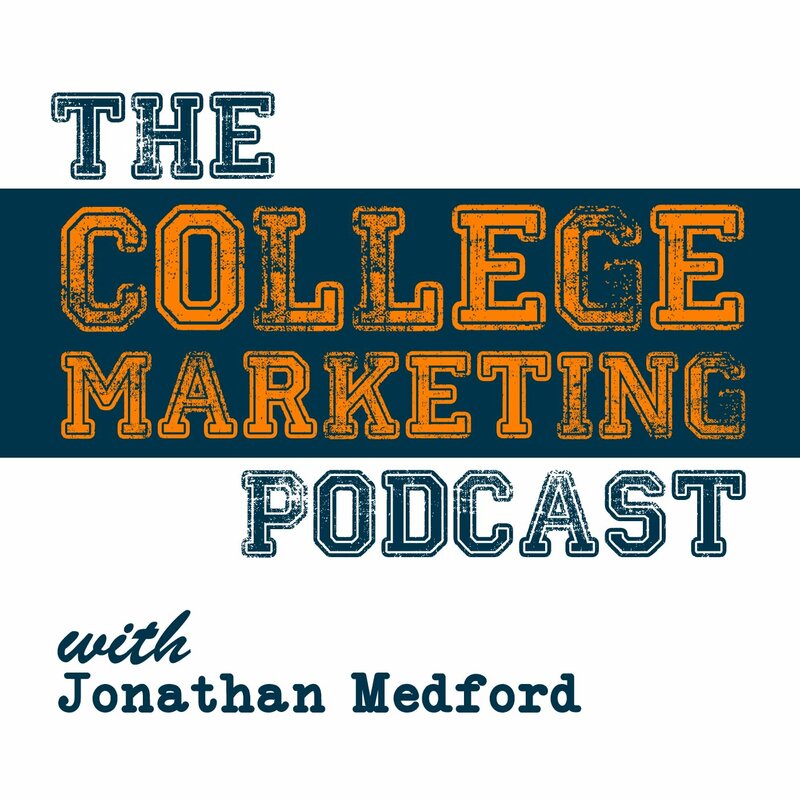 Welcome to the first episode of The College Marketing Podcast. I am your host, Jonathan Medford. Thank you for tuning in today, this is my very first podcast, I am so excited. Are you a regular listener of podcast? I guess I started about 3 or 4 months ago listening to podcast. I have a long commute to work from Whiteville, North Carolina all the way into Wilmington, usually takes me about an hour to get to work. Sometimes, the traffic’s bad, it takes me an hour and a half, so what I started doing was listening to these marketing podcasts that just really inspired me, and I tell you, by the time I got to work, I was ready to start implementing some of the tactics that I had heard about, so when we started College Inbound, I knew that podcasting was going to be something that I wanted to be a part of the business, so that’s why I’m doing this today. If you do listen to podcasts, what are some of your favorite ones that you listen to out there? I’m curious, [please leave a comment below]. My favorite podcaster by far is Marcus Sheridan, The Mad Marketing Podcast. I’ve listened to almost every single episode. He probably has about 70 some different episodes and I go through all of them. Marcus Sheridan is super talented, knows a lot about content marketing, and his show is just a straight up monologue. He can sit there for 40 minutes and talk to you like you’re just sitting right next to him, he ask good questions like you could actually answer him through the radio, and I just love his style of podcast. Now I’m no fool, I know I don’t have the talent that he has to be able to carry a show for 40 minutes like that by myself, so that’s not what I’m planning to do with this podcast. What we’re going to be doing, this is a podcast for college marketing professionals, specifically community college marketing professionals. I think that people at other universities could benefit from the show but our true audience, my passion, my love is community colleges, and so this is a show for community college professionals and it’s by community college professionals, and the way it’s by community college professionals is every single week, we’re going to be interviewing somebody in the industry, somebody at a community college throughout the country where we’ll be talking specific topics. We go to shows all the time and we hear from people that give a seminar on success stories, the best way to gather success stories, and the person that gives that seminar, that’s the kind of person I want to have on the show and that’s the kind of topic I want to have on the show. We’re at one recently and somebody gave a seminar on ADA compliance. It was a web information officer that gave a program on web accessibility for your website. That’s the kind of person I want to have on the show and the type of topic I want to have, so I’m very, very excited about that. All right, so for our first interview in our number 1 episode, I did not want to bring on a big time guest. Mayfield: Instead we brought somebody else on. Medford: That’s right. We brought on our very own Jake Mayfield. Web developer extraordinaire here at College Inbound. Thanks for being on the show today, Jake. Mayfield: Thank you for having me, I appreciate it. Medford: Awesome. First of all, I guess a couple of weeks ago, we went to the PRIMA show. Mayfield: Yes, we did. We had a wonderful time. We had a great opportunity to learn a lot, just a tremendous amount or step to begin from it. Medford: Absolutely. For those of you that don’t know, PRIMA is the Public Relations Information Marketing Association I believe. I might be getting that wrong, and this was the conference for the North Carolina, that organization. Medford: There’s community colleges from all over North Carolina that were there, mostly marketing professionals, website developers, web masters, graphic design specialists, public information officers, that sort of thing, so it was a good audience for us and what was really interesting was it was right here in Wilmington where we’re based out of. Mayfield: It was. It was a long drive in the morning. Medford: It was convenient. We found out about 3 weeks before the show was happening that it was going on so we didn’t have a whole lot of time to really prepare for it, so we didn’t really know what we were getting ourselves into, and to be honest, have you ever been in the Cape Verde community college? Mayfield: Before the PRIMA conference, I had not had that opportunity and funny enough, it was quite the impression walking to the Union Station building and it really set a certain tone and made an impression when you go in, and of course, when you walk into a building like that, it’s like walking into a lobby of major corporation. It’s set that impression of “What is this place? What is this place about?” Cape Verde community college definitely, they put a lot into their infrastructure and they’re setting an image with that, and it’s success, it’s what it is. Mayfield: It’s funny, I actually walked by her about 8 times because I was carrying stuff up for the conference, and every single time, she had a grin on her face and she would always smile and it is very generous and nice. She’s a lovely little thing. Medford: I love that lady. We need to hire away from Cape Verde. She seem like she’d be the great kind of person we want to have here. Impressions of the conference, so we get there and we had no idea how many vendors were going to be there. Mayfield: Yeah, we had no idea, but once we got the ball rolling and about 9 o’clock passed by, we had a general idea, and there were actually wasn’t a large number of vendors. It was kind of a select few but everybody there was bringing something to the table that was great, so the vendors that were there, phenomenal. Mayfield: Yeah. It was great. Medford: It was fantastic. Tell us about what the speed dating was. Mayfield: Speed dating essentially, and we found out about it pretty quick, we’ve only had about a minute or 2 to prepare. We were thrown deep into the pool, but essentially what … There’s a big room, a large room, and a bunch of vendors were sitting around, they each have their own table and the representative from each of the community colleges were cycling around, and basically I believe it was 8 minutes, correct me, I think it was 8 minutes. They would basically blow a whistle extraordinarily loud, ringing in my ears, but essentially, everybody would get up and they would go to the next table and you would sit down for another 8 minutes. One of the really I thought unique things about this approach was that it takes away that feeling of being anxious or maybe being pushy for the vendors because when you’re standing at your booth, you feel like you have to go out and be a little bit aggressive. It was nice to not have to do that. Medford: Absolutely. I feel like we’re not salesman. We don’t want to come across a salesman and the fact that we were able to break the ice with the attendees like that was just spectacular. Now the even organizers said that they were at a conference in Tennessee and they did a speed dating there, but the difference with their speed dating was it was when the show is at the tail end of the show, when it was all said and done, I thought what they did was fantastic in that they did it at the very beginning. It was the first thing that was done that broke the ice and set the tone. Mayfield: It was. I can’t speak to what the difference in terms of outcome would have been if having it at the end of the show, but I know that from having it at the beginning of the show, it definitely was a great way just to introduce everybody and everybody gets a chance to talk about who they are and where they’re coming from, and it was also even a great opportunity for the representative from the community college to sort of express some of the issues that they were having in their jobs and their goals, which are very challenging, very demanding. Medford: Kudos to the people that came up with that idea and implemented that, that was just fantastic for the show. We learned a lot about some of the issues that community colleges were faced with and the biggest one was this issue of ADA compliance and web accessibility. Mayfield: Yeah, that was definitely on the spotlight. That was something that a lot of people were still going around with this event. It seems like it had something to do with so many events that have been happening, been a lot of pressure on community college lately to get their websites to be ADA compliant. Medford: Now this came from … In South Carolina. Apparently, there’s a school down there that got sued because of lack of accessibility, and understanding is that the law firms, the disability law firms going around and they’re developing these structured settlement agreements, and North Carolina has entered into a structured settlement agreement so by the end of 2017, all community colleges have to have a website that is accessible. Mayfield: Essentially, yeah, accessible and ADA compliant. I’m not sure, is it that they have to be ADA compliant or that demonstrate proof that they’re working on it? Medford: I think immediately, the recommendation is that they prove that they have a plan and that they’re actively working on it, so even if it’s in the future, just because they’ve come up with a settlement agreement doesn’t mean that she shouldn’t have this plan in place. Medford: That was really interesting. Mayfield: It makes perfect sense. You have to make sure that your website is available to all people, all ages, all disabilities across the board. It’s just the name of the game and it’s being fair. Medford: Absolutely, but one thing, we gave this talk on inbound marketing 101 and you’re there, you videotaped me while I was doing it. Mayfield: It was phenomenal. You did a great job. Medford: I wanted you to videotape me because my wife says that I say “Uhm” a lot. Medford: I made a conscious effort. I knew I was being videotaped and I think I did pretty good in that regard. Mayfield: After maybe 1 or 2 minutes in, that all went away. Medford: I learned a very valuable lesson there over prepare the length of your seminar. I could have thrown on a lot more slides in there, gone into more depth with some things that I … I was trying to be broad about inbound marketing in general. Mayfield: Yeah, they were trying to get it up though but it was almost like there was a string tied to their wrist and to the hip and it wasn’t going up. Mayfield: That was a great surprise. Medford: There’s some great analytical feedback that you can get through hubspot that you can’t have through Google Analytics for instance, and I was like, “You’re from Gaston, aren’t you?” She’s like, “How did you know that?” I might have freaked out a few people because I did my research. I had a great time. I’m looking forward to doing more events like that. Mayfield: I am as well. Again, it was a wonderful opportunity to learn a lot about what everyone is trying to do and the challenges that they’re trying to meet, and there’s some big challenges, but it’s nice to be able to help, hopefully bringing some solution to the table and just help people with what they’re trying to do. Medford: They did something else. They did a round table discussion outside. There’s a little veranda on the 5th floor of this building that overlooked the Cape Verde river. The view of that was just out of this world. It was outdoor and so we all sat outdoors and they just had a group discussion discussing different marketing tactics that’s working for them is kind of a share and learn session, and that was really cool and as a vendor, we just kind of sat in on it because I really want to get their insights on what they felt was working for them and what wasn’t. Mayfield: That was a great talk and it was neat how they did that too. Remember, I think they wrote questions beforehand and then they picked out of a hat. They would all weigh in on what they’re each trying to … It’s funny, that one problem, that one [inaudible 18:55] is the same problem that everybody’s having. Mayfield: It was just nice to get some input from all the different areas and what people are trying to do, and the other thing I learned too about that was seeing how different people and different role were trying to tackle the same problem, and that was interesting to me. You have a webmaster trying to tackle a marketing problem and then there’ll be some crossover there, but it’s funny, those are uniquely different roles essentially. Medford: They covered a wide variety of topics. They talked about web hosting. It was interesting to hear the wide variety of web hosting solutions you heard out there. Mayfield: I never expected, I’m not picking on anybody and I’m not mentioning name, but I never expected GoDaddy to come up. Medford: No. For community college, GoDaddy was probably the last thing I thought I would heard as a hosting provider. Medford: Then you heard the other end of the spectrum with people that had dedicated hosting solutions. One person said they pay 400 a month and another one pays $800 a month just for hosting the website. That was an eye opener for me. Mayfield: It was, it really was. Medford: What else was discussed at that event during the session? We had Google AdWords. Medford: GIS, the county GIS information and mapping that … That was an interesting concept. Medford: He said that basically, you could match up where your students are coming from geographically. That way, when you’re doing things, marketing tasks as simple as distributing posters for an event or for a recruiting event of some kind, you would know what sinners to go to. Mayfield: I think it’s a valuable tool for helping you figure out what your placement should be in trying to maximize your ROI for any kind of traditional advertising. Medford: ADA was a big topic, again, at that session in itself. That took up probably the majority of the discussion that was going on. Mayfield: That’s right. I would even say it probably took up about half, if I’m recalling right. Medford: We are going to be doing a lot more of these events. We’re definitely going to be at PRIMA again next year. We’re looking for other PRIMAs out there that we can attend so if anybody out there knows, let us know. Mayfield: We know there are. Medford: Yeah, so we’re looking. I did go ahead and sign up for the eduWeb Digital Summit. Last year, that event was held in Baltimore, and in 2016, I believe this event happens in August, it’s going to be at Denver, Colorado. Mayfield: It’s going to be fun. Medford: I’ve already signed up, I’m going to be giving a talk on inbound marketing 101 again, and I’m developing another concept. Inbound marketing 101 is kind of like your beginning track for content marketing, inbound marketing, and they have a content marketing track at this event, so I’m hoping that there will be some more advanced users there as well, so what my plan is to give a talk on getting buy in throughout your organization, throughout the community college for content marketing and doing that through workshops because what we’re finding is if you want to really get buy in throughout the organization for content marketing, you need to hold a workshop, you need to explain the what, the when, the why, and that’s the best way to do it, so I think we’re going to have an advanced seminar on that, so that should be interesting. I’ll have a little bit more slides just in case I’ve run short. Mayfield: I’ll shove some into the end there without you knowing, just in case. Medford: Sounds good. One thing I want to mention while I have you here, I noticed that Twitter has a new feature for polls. Mayfield: Yup. This is a neat one. This is great. Medford: Really cool. I was really, really excited that you could give a poll on Twitter now, but one thing that really disappointed me is the name of this podcast, I wanted to throw out 3 or 4 name ideas out there and do a poll and see what people had, and just like Twitter, the little answers for each poll also has limitations in terms of text, so “The Content Marketing Podcast” would have been “The current market … ” and that was it, so I was like, “Okay, forget this. I don’t know if I’ll ever be able to use it,” but maybe somebody can figure that out. Mayfield: Short, concise, that’s what it is. Medford: There’s got to be some uses of that for community colleges for sure. Medford: That was really neat. Jake, thank you so much for being on the first episode of The College Marketing Podcast. Mayfield: Thank you for having me, it’s a pleasure. Medford: I hope you feel honored that I was willing to mess up this first episode on you instead of somebody else. Mayfield: I hope I didn’t mess it up too much. Mayfield: I hope you’ll have me back again. Medford: We have several exciting interviews lined up over the next few weeks with higher ed marketing professionals like yourselves so stay tuned to future episodes of The College Marketing Podcast. Be sure to leave a review on iTunes and leave comments on our blog at collegeinbound.com. If you liked the show, please share it with your colleagues. Remember, always strive for better marketing.